The maximum speed, 53 kt wave-piercing catamaran named as 'Ocean Supremacy' is designed to save an average 4,000 tons of CO2 per year. Amazingly, if plugged in to a suitable shore connection it is claimed to be capable of feeding >200 Mwh's electricity to the national grid to offset an annual carbon neutral cruising range of 3,600nm at 18knts. 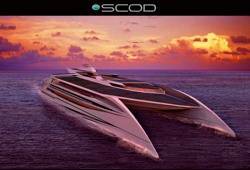 The Ocean Supremacy design incorporates a 9 MW solar hybrid propulsion system powered by a combination of sustainable sources of energy that integrate and exploit the availability of; solar, wind, wave and bio mass diesel power.